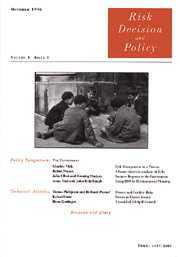 Established in 1994, Risk, Decision and Policy publishes decision and risk research. The journal considers applications of descriptive, prescriptive and normative decision research in a wide variety of areas. From 2002, the journal will publish articles on foundations of decision-making under risk probability, choice and games and welcomes contributions from philosophy, mathematics and economics. It will also publish commissioned reviews, with peer commentary of topical problems concerning environmental decision-making under risk.